I don't want to make those of you working this week feel jealous, but I used part of my time off yesterday to clean out my fridge. I know. 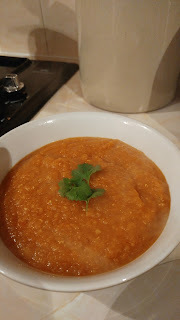 This recipe proves that even the most dodgy looking (shriveled actually) root vegetable can be turned into soup. I took the celeriac out of the fridge to clean it and didn't want to put it back in. Nice. There's no chilli in this one, and I think I missed the spice although it was still tasty, so add it in if you like. Slice the carrots and dice the onion and celeriac. Tip the veg into the largest pan you have and just cover with water. Bring to the boil and reduce to a simmer to soften the veg. Whilst the veg is softening, add the spices to the pan. Tip in the red lentils. I don't bother rinsing them! Stir well, and add the tomatoes if using. They make the soup more orangey and give a slight sweetness. Add the rest of the water and bring to the boil, then reduce to a simmer until all veg are soft. Blend with a stick blender and add more water if it's too thick. Sprinkle with coriander if you have it growing on the windowsill!